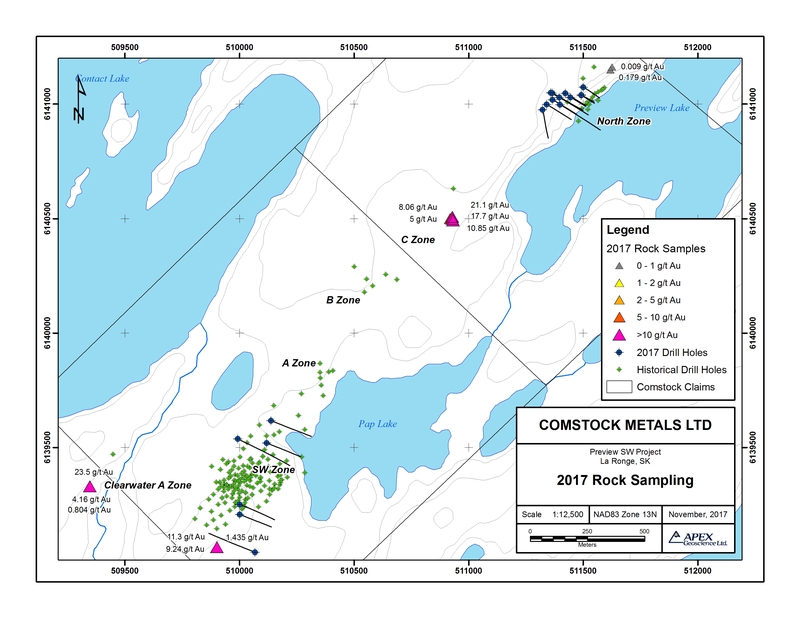 Vancouver, BC – November 9, 2017 – Comstock Metals Ltd. (TSX-V: CSL) (“Comstock” or the “Company“) is pleased to report the balance of results from the summer exploration program at its 100% owned Preview SW gold project located 40 km northeast of La Ronge, Saskatchewan. These include results from 1,017.0 m in 4 NQ drill holes completed on the southern flank of the Preview SW deposit, continued modelling of North zone mineralized zones, as well as surface sampling. Previous results from the summer program were reported in the Company’s September 28, 2017 news release. 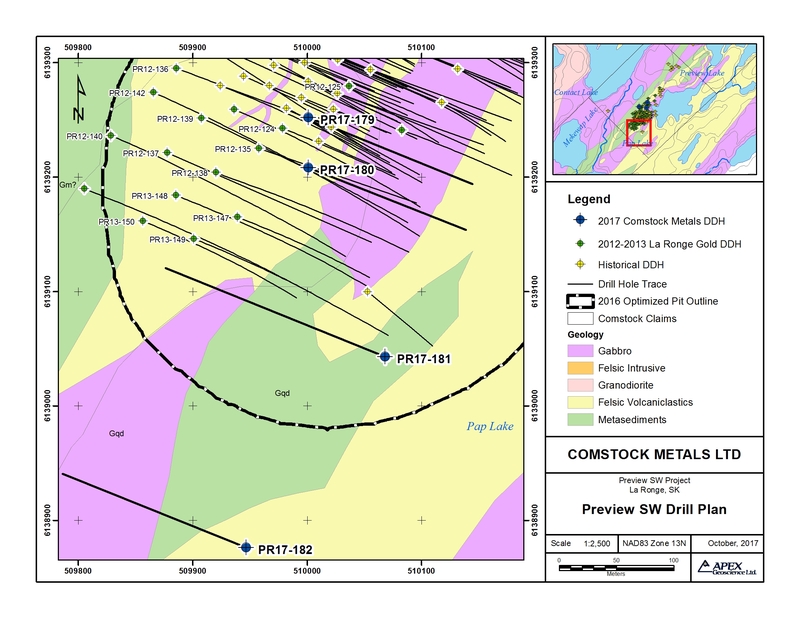 “The 2017 winter and summer exploration programs have significantly advanced our understanding of the structural controls to gold mineralization on the Preview project, highlighted the potential at the North zone – particularly to depth, and identified new targets for future exploration” commented Comstock CEO David Terry. A total of 3,888.5 m in 19 NQ diamond holes were drilled during the winter and summer 2017 campaigns of which 2,111.5 m in 11 holes was completed during the summer program; 7 on the Preview North zone and 4 at the southern end of the Preview SW deposit, reported herein. At the North zone, new modelling of the drill data modelling has defined three (formerly five) principal parallel structures/veins/vein zones along which the main mineralized intercepts occur, extending 350 m along strike and to a depth up to 140 m below surface; higher grades intersected to date occur within a core zone over a strike length of approximately 170 m. Structural data collected during the winter and summer programs indicates a steep plunge to the mineralization, suggesting good potential for encountering additional gold mineralization at depth, as evidenced by the longitudinal sections for Zone 1, Zone 2 and Zone 3. There is also excellent potential for identifying additional high-grade shoots along and across strike. A 3D visualization of the North zone drill holes and interpreted zones can be found by following this link. 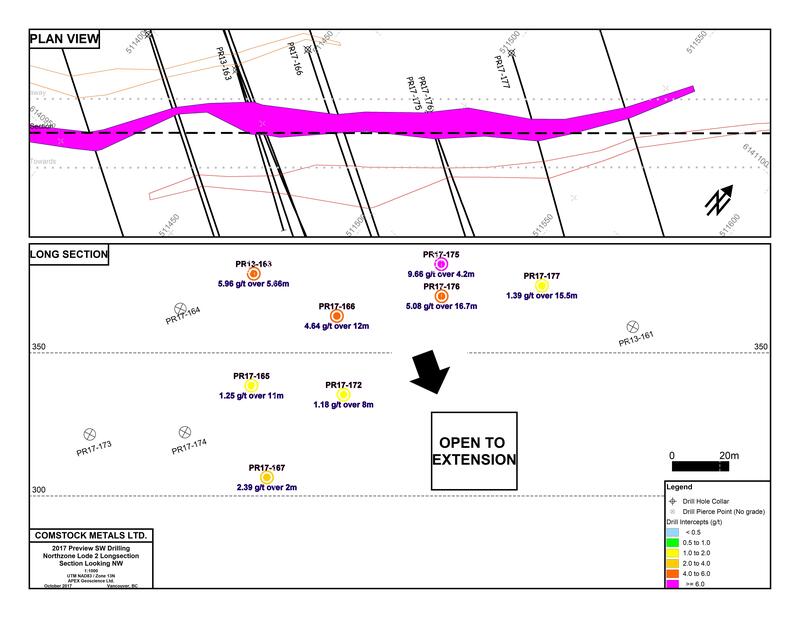 Drill results reported herein are from holes drilled in the southern half of the SW deposit, designed: 1) to test down-plunge (PR17-179) or up-plunge (PR-180) of adjacent holes and to test for southwestern continuity of the eastern lodes and 2) to test the southwest strike extent of the SW deposit (PR17-181, 182). Significant weighted average intercepts are presented in Table 1 and hole descriptions are provided below. Hole locations are shown on Map 1. The Company also reports that it has now completed a fall drilling and soil sampling program at its QV gold project in Yukon; a total of 904.4 m in 6 holes were drilled on the western flank of the VG gold deposit, 3 of which did not reach planned depth, and a total of 650 soils were collected in three areas of the project. Metallurgical studies, data interpretation and detailed planning for the next phase of work at Preview is ongoing. 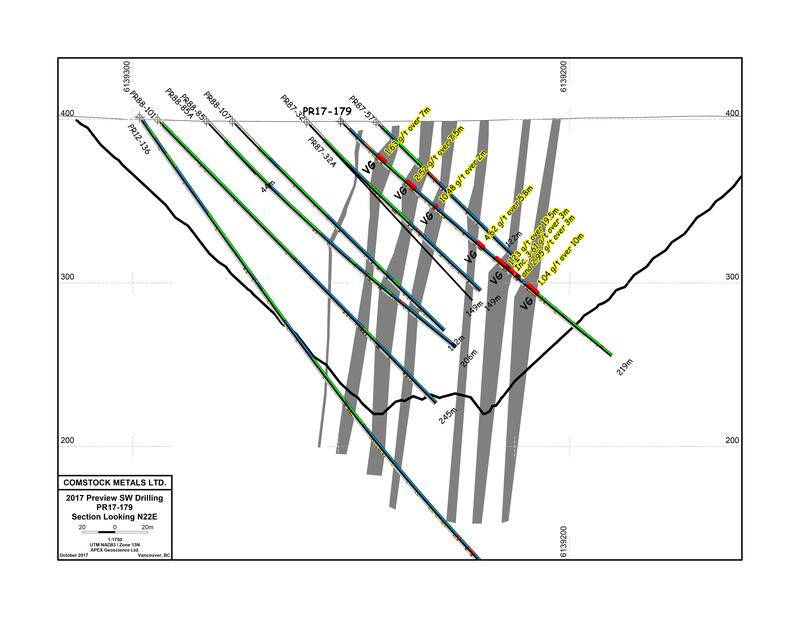 Preview SW drill hole PR17-179 (-45°/112 azimuth), located in the southern half of the Preview SW deposit, was designed to test the down-plunge extension of mineralization in historical drill hole PR87-54 and the continuity of the eastern modelled vein loads (Section 1). The hole collared into diorite and passed through felsic to intermediate meta-volcanic rocks from 19.1 m to 26.7 m and 34.0 m to 54.0 m down hole. Footwall meta-volcanic rocks were encountered at 159.4 m down hole. Multiple zones of quartz-carbonate veining were intersected within sheared diorite host rocks. Most of the vein zones are associated with arsenopyrite-pyrite and/or pyrrhotite-pyrite mineralization, and multiple occurrences of visible gold. 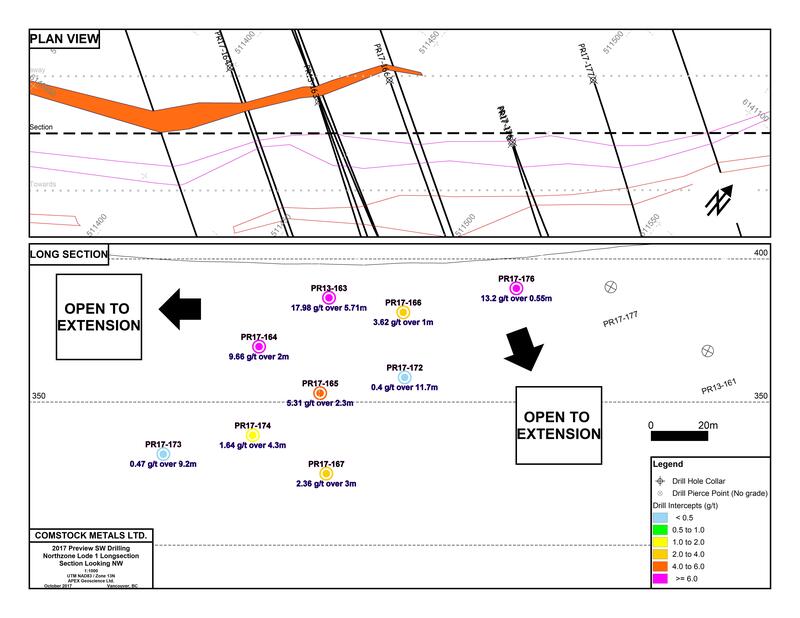 Modelled vein lodes 102 through 106 were recognized within PR17-179; one additional mineralized zone was encountered from 150.5 m to 160.5 m, below the termination of the historical drill holes on section. The additional zone is believed to correspond to the southwest extension of vein lode 109. All mineralization encountered in PR17-179 occurs within the Lerchs-Grossman optimized pit shell. 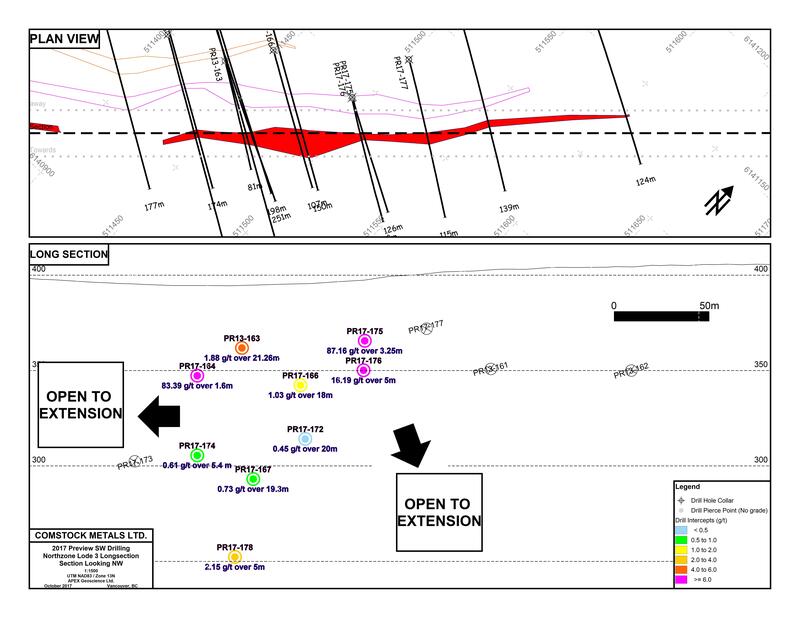 Preview SW drill hole PR17-180 (-44°/111.5 azimuth) is located 43 m south of PR17-179 in an area of limited historical drilling. The hole was designed as a shallow test of modelled vein lodes 103 through to 106 (Section 2). 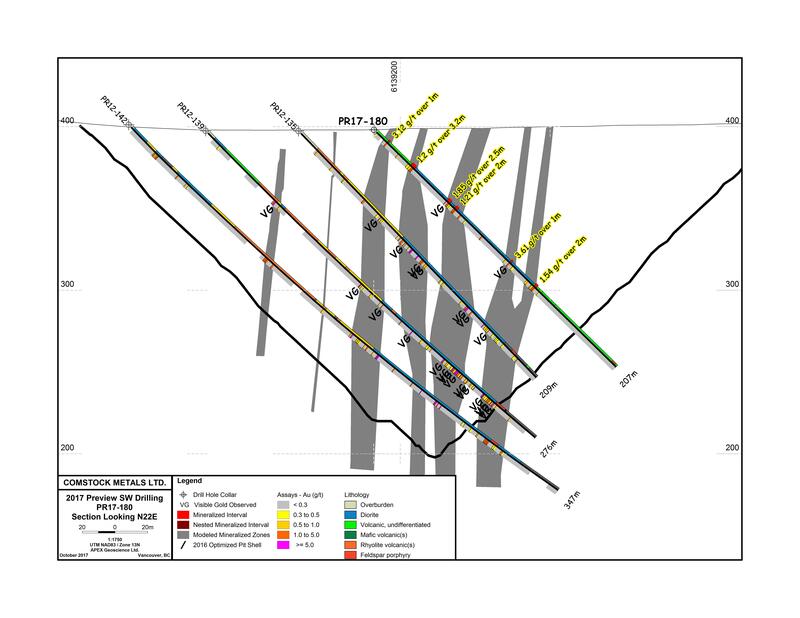 PR17-180 collared into meta-volcanic rocks and encountered diorite host rock at a depth of 34.2 m down hole. Footwall meta-volcanic rocks were encountered at 135.5 m. Several narrow zones of quartz-carbonate veining were encountered within sheared diorite, associated with arsenopyrite-pyrite-(±pyrrhotite) mineralization. Visible gold was observed at 62.3 m and 116.1 m down hole. Preview SW drill hole PR17-181 (-45°/292 azimuth) was designed as a 30 m southwest step out on the Preview SW deposit (Section 3). The hole encountered a suite of variably sheared, mixed meta-volcanic and meta-sedimentary rocks. Three mineralized vein zones were encountered, showing a strong association with arsenopyrite and/or pyrrhotite mineralization. The zones are believed to correspond with modelled vein lodes 101, 103 and 104. Preview SW drill hole PR17-181 (-55°/292 azimuth) was designed as a 200 m southwest step out on PR17-181. The hole collared into mixed meta-volcanic rocks and encountered diorite from 272.6 m to 296.3 m down hole. Several narrow mineralized vein zones were encountered, associated with arsenopyrite and/or pyrrhotite mineralization. No significant gold values were reported. 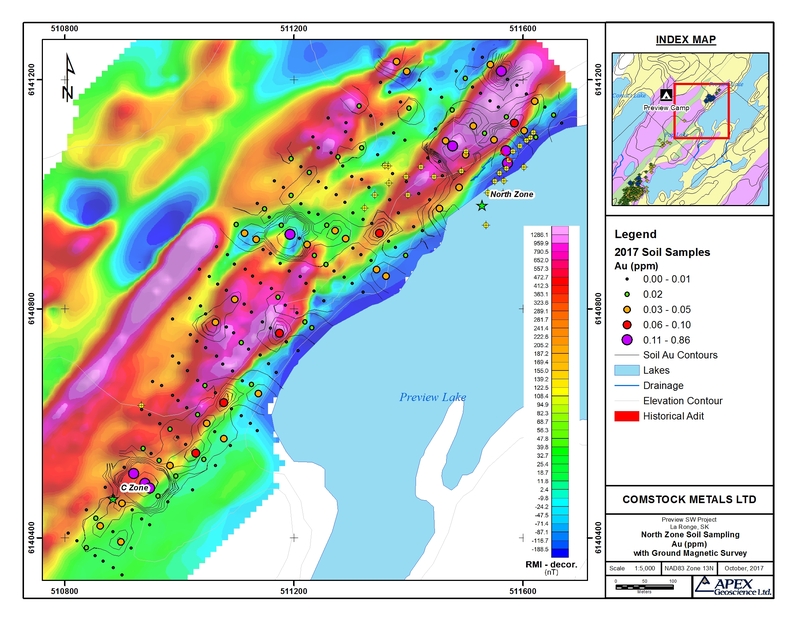 During fall 2017 the Company collected a total of 243 Ah (humus) soil geochemical samples over a 1,000 x 250m area covering the North zone and C zone, located 800 m to the southwest along strike. Soils were collected at 20m intervals along 50m spaced northwest-southeast trending gridlines as shown on the Map 2. Soil samples were submitted to ALS Minerals for trace level gold and multi-element analysis of a 25g sample pulp by ICP-MS. Gold in soil analyses ranged from below detection up to 0.86 parts-per-million (ppm) Au (95th percentile = 0.054 ppm Au). The outcropping North and C zone gold showings are associated with highly anomalous gold values including 0.46 and 0.22 ppm Au (North zone adit area) and 0.47, 0.41 and 0.14 ppm Au (C Zone trenched area). The results of the orientation humus soil geochemical survey defines 3 gold in soil anomalies not associated with known areas of mineralization. The highest gold in soil value of 0.86 ppm Au is associated with a poorly resolved 150 x 30m NE trending zone of spot high gold in soil values lying along the west margin of a prominent topographic and magnetic high anomaly that parallels the North zone. The anomaly is significant in that it lies 70m to the northwest of the North zone vein lodes and may represent an offset zone of parallel mineralization not tested by the 2017 drill holes. The largest gold-in-soil anomaly anchors a multi-(4)-line east-west trending gold- in-soil anomaly located immediately south of the North zone. The anomaly has dimensions of approximately 250 x 30m, and comprises 10 samples ranging from 0.74 to 0.022 ppm gold; including 4 samples in excess of 0.41 ppm gold. The anomaly coincides with a conspicuous airborne and ground magnetic low structure oriented oblique to the dominant NE-SW lithologic trend. The magnetic low was targeted along its eastern margin by North zone drill hole 17PR-168 that returned multiple gold intercepts; including 0.91 g/t over 3m (reported in the Company’s June 7, 2017 news release). The C zone soil anomaly includes anomalous gold values extending a distance of 250 m to the northeast in an area not previously known to host mineralization. The combined C zone soil (350 x 50 m) anomaly comprises 12 samples ranging from 0.021 to 0.47 ppm gold; of which three samples returned values greater than 0.1 ppm gold (100 parts-per-billion). 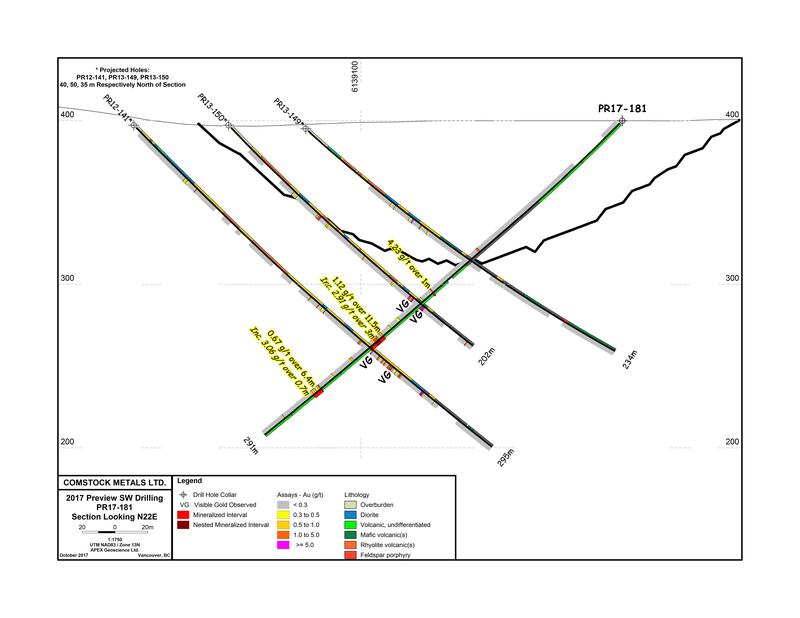 Also during the summer program, the Company collected 14 rock grab samples targeting a number of under-explored historical showings and areas untested by drilling (see Map 3). Multiple high-grade gold values were returned from the C zone, SW zone and the Clearwater A zone, including 5 samples with greater than 10 g/t Au.